How Trump's name is an aptronym. Do Our Names Shape Our Destinies? Trump’s Might. 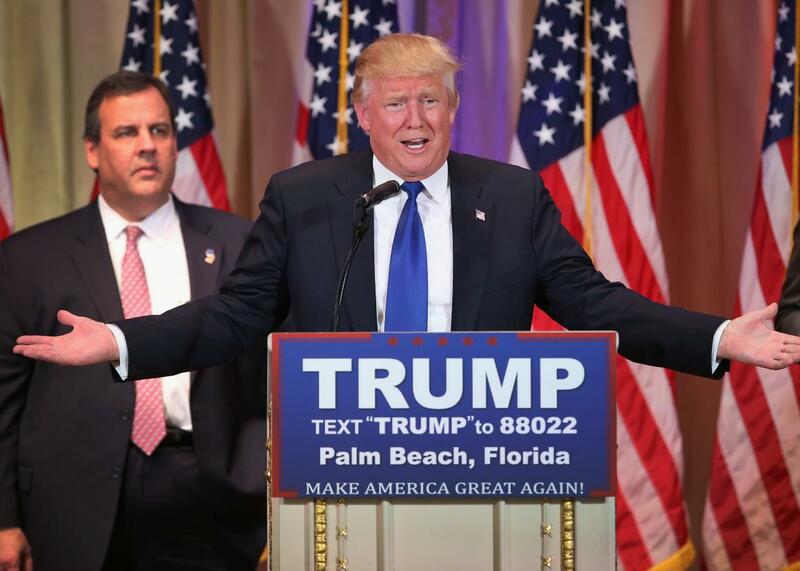 Donald Trump continues to ace the presidential primaries. He is proving quite adept at wooing states and groups of voters that were supposed to be easy victories for his Republican opponents. Whether winning over white evangelical voters in the Deep South or working class voters in Middle America, the New York billionaire routinely, well, trumps the rest of the field. This phenomenon of a person’s name being a fitting description of their appearance, actions, or accomplishments is called an aptronym. Consider, for example, the felicitous fact that New York television personality Amy Freeze is a meteorologist. Or the famous example resulting from a Slate article that became a popular story in the Wall Street Journal’s Law Blog a decade ago when they learned of a lawyer named Sue Yoo. Perhaps the most infamous instance is that of Anthony Weiner, a former congressman who resigned from office after pictures of his, ahem, “last name” showed up on his Twitter account. The word trump is defined as a playing card of a particular suit that outranks cards of another suit. And in its use as a verb, it means to outdo or surpass. There is no question that every one of this year’s Republican candidates for president has been trumped. When Trump resorts to name-calling, holds raucous rallies that draw audiences in the thousands, and employs media savvy that makes him the subject of every conversation, he is playing the trump card. It’s a feat that none of the other candidates have been able to match, and not for lack of trying. While some may consider the aptness of Trump’s name an unfortunate coincidence, there is evidence to suggest that our names do influence how we view ourselves and the world around us. Aptronyms have long been a feature of mankind’s naming conventions. The ancient Romans used the phrase nomen est omen, which means “name is destiny” or “your name is a sign.” There are rumors that Roman armies would put soldiers whose names meant victory at the head of the formation when marching into battle. Further, we all know people who were named after a family member, religious figure, celebrity, or were given a name because it sounds creative, beautiful, or strong. Our names, either through etymology or association, can commemorate loved ones, evoke certain desirable characteristics, or convey a blessing for future happiness and success. But can names really be signs? Science confirms the effect our names have on our life choices and outcomes. Social psychologists have shown we have a real affinity and preference for the letters that make up our name, particularly our initials. They call this implicit egotism. For example, in a paper titled, “Why Susie Sells Seashells by the Seashore,” the researchers found that people with the names Dennis or Denise are over-represented among dentists. Our names can affect the cities we choose to live in: There are a disproportionate number of people named Philip living in Philadelphia, Mildred in Milwaukee, Louis in St. Louis, and Jack in Jacksonville. Our initials can even influence the streets we choose to live on and the cars we buy. Because my name begins with a T, I am more likely to own a Toyota or a Tesla. Further, our names are a form of presentation of ourselves to the outside world, and this can sometimes have harmful consequences. Studies abound about how Americans with black-sounding or ethnic names face discrimination in different ways. In one experiment those with black-sounding names were less likely to be hired and to receive callbacks on résumé submissions and business inquiries. It was recently discovered that AirBnB hosts discriminated against potential residents with black-sounding names. It’s not all bad news, though. One rather interesting study found that black men who were named after famous figures lived longer than those with more common names. This study is of particular interest to me—my full name is Theodore Roosevelt Johnson III, and my grandfather’s death certificate happened to be part of the study. As it turns out, my name is an aptronym, too. It stems from the occasion when President Theodore Roosevelt invited black civil rights leader Booker T. Washington to dine with him at the White House. My great-grandparents were so inspired by the gesture of racial equality that they named their second son after the president. Fast-forward 100 years, and I share college alma maters with Washington and Roosevelt—Hampton University and Harvard University. Roosevelt was an assistant secretary in the Navy, where I have served as an officer for two decades. Their dinner was an informal meeting of the minds to devise ways for Roosevelt to leverage the political support of blacks in the Deep South. My current doctoral research centers on black voting behavior—a topic I took deep interest in during my year as a White House fellow. Of course, the aptronym hypothesis is not without its misses. After all, rubio is a Spanish word for blond or fair-haired. But Donald Trump’s strong showing in this presidential election cycle, coupled with his business and media successes, seems to be an actuation of nomen est omen. And if he continues to win primaries despite all conventional political logic, there may be no more appropriate word for what he’s accomplished at the expense of more seasoned and entrenched politicians. We are on the cusp of confronting this hard reality: Trump’s march to the Republican nomination may just be in the cards.